As you're reading this tonite, I'm officially starting my first night as a BOWLER, on a Monday night bowling league! YIPPIE! LOOK MOM, I'M A BOWLER! Yesterday we got together and did a little 'practicing' at the bowling alley. I did okay, I bowled a 92, a 100 and a 140! ONE-FORTY! Holy crap, I have to aim low, I can't ruin a low average with a 140 game! Except who knew you needed kneepads and a helmet for bowling; I ended up sprawled out in the lane at one point. 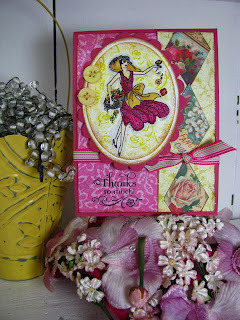 So on to stamping; tonite I'll post another girlie thank you card from the new Crafty Secrets "Glamour Girls" set. For this card I used papers from Crafty's "Radiant" paper pad, and my oval nestabilities. To make the flowery background behind the flower-throwing chickie, I used my hero arts distress background, stamped barely banana ink on it. 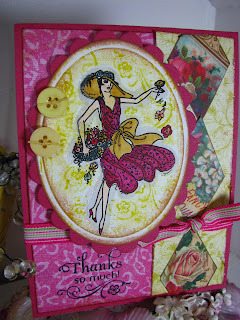 Then I "kissed" the flower swirl stamp from this set onto the background block in a darker yellow ink. I created a post-it note mask of the girl image, laid it on top of her and then stamped the background block onto the oval. Clear as mud, right? I filled in the slight white outline of the girl with warm grey w2 copic, to create some shading. Copic colors used: red violet & carmine for her dress, skin white e00, pale sepia for her bow & hat. Have fun tonight!!! Your card is great! I love the bright cheerful colors! Gorgeous!!! (Are you becoming a sand bagger already at bowling? LOL!) My hubby is a really good bowler and when I met him a thousand years ago, people would ask him if I was a bowler (I am DEFINITELY not!). I always thought that was funny, like it was a prerequisite or something! What a lovely card, many lovely colours and the stamp is great. You crack me up.... I haven't bowled in years (like 20) because it was guaranteed that I'd go sprawling down the lane instead of the bowling ball, lol. Love your cards. It's so fun to be able to put a face with a name when I flip through the stamp magazines (woohoo). also loved your tutorial on coloring :-). Another great one -- I always love all the *excitement* in your work by the way you combine papers, colors and patterns -- FUN STUFF!!! It's the long weekend; time to party! I want it all & I want it delivered! 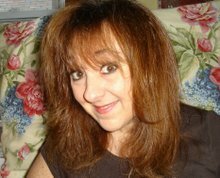 Crafty Secrets Witchie and New Design Team!